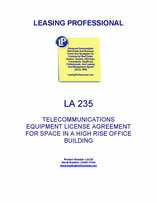 This License Agreement permits a telecommunications vendor to locate equipment in an office building. The agreement is characterized as a license agreement to avoid the possessory rights that accrue to the tenant under a lease agreement. The licensee (the telecommunications company) receives the right to locate its equipment in a suite in the office building, and the licensor (landlord) gets paid for allowing the licensee to do so. This License Agreement (the "Agreement") is entered into as of ___________ ("Effective Date"), by and between Commercial Property Landlord, a _______________ Limited Liability Company, and Commercial Telecom Licensee, Inc. ("Licensee"). 1.1 The space, cage or cabinet to be licensed for use by Licensee is located at _____________________, and is referred to as Suite__________ (the "Premises"). Licensee shall install and test all equipment placed within the Premises at the time of its installation. With respect to all installed equipment, Licensee shall ensure the following: (1) that all such equipment has been installed safely, and in accordance with all applicable laws; (2) that no equipment shall appear sloppy or unsightly; and (3) that all equipment shall be securely anchored against the possibility of earthquake. Licensee shall be solely responsible for the installation, operation, maintenance, use and compatibility of equipment or software not provided by Licensor, and Licensor shall have no responsibility or liability in connection therewith. Licensor shall provide Licensee with AC and DC power and shall use its best efforts to keep the Premises at a reasonable temperature and humidity level (temperature and humidity levels will be in the range required by the manufacturer of telecommunications switching equipment) at all times. Licensee shall not cause or allow any equipment or wiring to remain outside of its licensed space at any time. 1.2 Licensor shall use its best efforts to ensure that Licensee shall have access to its licensed space 24 hours a day, 7 days a week. Licensee shall have inbound access to suite at all times, twenty four hours a day, seven days a week. However, pursuant to rules of the building, Licensee may only remove equipment from the Premises on 24 hours notice, between the hours of 9 a.m. and 5 p.m., Monday through Friday (excluding Holidays). Said notice of removal shall be made in writing. 1.3 Licensee acknowledges that this Agreement is conditioned on and subject to the continued use of the facilities in accordance with manufacturer's instructions for the Equipment. The Premises may not be used for any other purpose, or in any other way, without the express prior written permission of Licensor. Violation of this provision shall act as immediate termination of this Agreement and a revocation of the License granted herein. 1.4 This Agreement is a contract for use of telecom connection opportunities and shall not be construed as a lease. Licensee expressly waives all rights and defenses based on any and all theories, assertions, or position that this Agreement or any part thereof is a lease. 1.5 Subject to Section 3 below, Licensor acknowledges and agrees title to any and all equipment located by Licensee in the Premises will be the sole and exclusive property of Licensee. Recurring Fees: Licensee agrees to pay all applicable rates and charges set forth in Exhibit A applicable to this Agreement. The recurring component of the license fee shall be due on the first day of each month, in advance, irrespective of whether or not an actual invoice for payment is received by Licensee. If payment in good funds is not received by the tenth day of the month, Licensee hereby agrees to all interest and penalties as set forth herein. Any amount not paid by the tenth day of the month shall bear interest at the highest rate permitted by applicable law. If Licensee fails to pay all recurring charges due and owing hereunder by the first day of the subsequent month, Licensor may terminate this Agreement and/or suspend any and all services hereunder, and, may thereafter proceed with all remedies set forth herein. 2.1.1 Non-Recurring Fees: Payment for the non-recurring component of any fees or costs for installation or new agreed upon services shall be payable upon Licensee's receipt of Licensor's invoice for the same. Any amount not paid within thirty (30) days of an invoice date shall bear interest commencing on the invoice date to the date of payment at the highest rate permitted by applicable law. If Licensee fails to pay all amounts due and owing hereunder within thirty (30) days from the invoice date, Licensor may terminate this Agreement and/or suspend any and all services hereunder. Thereafter, Licensee will be charged, in addition to any other fees, a reconnection fee in the amount of $500. In the event Licensee disputes any portion of an invoice, Licensee shall timely pay the full invoiced amount and provide Licensor, within thirty (30) days of such payment, a written statement containing all information supporting Licensee's position regarding the disputed portion. Licensor shall determine in its good faith business judgment whether such invoiced items were erroneous, and shall issue an appropriate credit to Licensee if it so determines. 2.2 Licensor reserves the right to change or modify the fees for the services, or eliminate or modify certain services, upon not less than forty-five (45) days advance written notice to Licensee. In the event of notice of such change in fees and/or services, Licensee may terminate this Agreement, without penalty, on the effective date of such change upon at least thirty (30) days advance written notice to Licensor. 2.3 Licensee will pay all sales and use taxes, as well as duties or levies, arising in connection with this Agreement. Licensee's execution of this Agreement signifies Licensee's acceptance of Licensor's initial and continuing credit approval. Licensor reserves the right to withhold initiation or full implementation of any services under this Agreement pending a review of Licensee's creditworthiness. If at any time there is a material adverse change in Licensee's creditworthiness, then in addition to any other remedies available to it, Licensor may at its sole discretion: (i) withhold or cease providing services; and/or (ii) condition continued services until Licensee provides Licensor with such assurances of payment as may be acceptable to Licensor.